The dress code in most places of worship is relatively simple: no exposed shoulders, no shorts. However, they vary in strictness. In Christian Orthodox churches and in mosques women are expected to cover their hair. At the Royal Palace in Bangkok, a shawl over one’s naked shoulders doesn’t count – it has to be sleeves. Selecting and packing clothes that are matching, easy to wash and comfortable is challenging enough. How to prepare for very uneven cultural requirements while still keeping to the size dictated by cheap airlines? My absolute favorite clothing items to navigate a complex religious landscape like that in Israel and the West Bank are photographed above. (1) is a real discovery – I think I found it in Budapest, and I only hope I can find one more before this one is worn off. This piece of clothing only covers the shoulders and arms above elbows – it is tiny and fits anywhere. It immediately transforms a comfortable T-shirt into a religiously appropriate attire. (2) is a 3/4 long skirt. It isn′t optimal, because it wrinkles when folded and is, due to the pattern, difficult to match with other travel clothing. But it folds neatly and takes very little space. Also, it is very easy to slip on and off, and convenient for changing into a swimming suit when necessary. 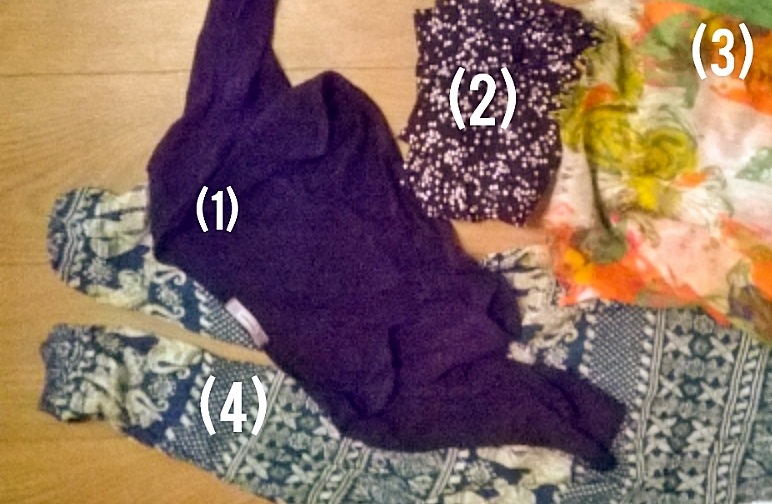 (3) is a large scarf, which I got as a birthday present from my friend M. The material is very thin, so it doubles as a shawl, a sitting mat, and a sheet if I don′t have a clean surface to sleep on. (4) are ′elephant′ pants that every tourist buys in Thailand. They fit into a handbag and are easy to wear on top of shorts to enter a place of worship. With these things in my bag I can wear whatever is comfortable in a given climate for the rest of the day. How do you dress for a long day, which includes visiting places of worship?